I know why sleep deprivation is used as a form of torture. When my daughter, Ava, was born, I felt like a prisoner of war. Not from the beginning, because as a first-time mom, I had no idea what was “normal.” Yes, I know…babies don’t sleep. Those lucky moms and dads who have a good sleeper are often secretly, or even occasionally publicly, begrudged by those who deal with colic, reflux, or more night-wakings than usual. But, what happens when there are compounding factors: medications, monitors, feeding tubes, oxygen, IVs? This is when the sleep-deprived new parent graduates to a new, and potentially dangerous, level of exhaustion. Ava was born with severe gastro-esophageal reflux disease, or GERD. She was a screamer, a puker, and a terrible sleeper from Day One. Looking back, I don’t think I even realized how tired I was, because I was too busy basking in the delight of all that was newborn Ava. I don’t think I even noticed when all of my friends and their healthy babies began sleeping through the night. I think I only truly realized how bad things were when I finally started getting some sleep! Before Ava had her first fundoplication and G-tube placed, things were pretty awful in our house. Ava was sleeping--if you can even call it sleeping--in 45-minute stretches, waking up screaming. I was still nursing in an attempt to keep her nourished and hydrated, as she had essentially stopped drinking and eating solids around her first birthday. I would scoop her up out of her crib and we would trudge to our nursing chair, where she would writhe in pain, screaming until she could latch on. She would nurse for two or three minutes to calm the burn and then fall asleep delirious and exhausted. Dog-tired and delirious myself, I would either fall asleep and wake myself with a jerk or sit awake, watching her sleep and dreading falling asleep myself. I was terrified that I would doze and let my breast fall across her face, so I often sat vigil and just waited for the next round of screaming to begin. Night after night, this was our ritual. We had a loving “mama dog,” Raleigh, who faithfully woke up with me every time Ava stirred. She was my footrest and my confidant. She listened to my fears, she listened to my lullabies, and she listened as I cried tears of frustration and exhaustion. Yes, I was talking to the dog. Was I hallucinating? Yes and no. Raleigh was a great companion during those long nights, but the serious effects of sleep deprivation had begun to take hold, and I was struggling with many symptoms worse than canine conversation. I was working and going to school as well, and in hindsight, I see even more now that I was definitely not at my best, due in large part to lack of sleep. Decreased Performance and Alertness: Reducing your nighttime sleep by as little as one and a half hours for just one night could result in a reduction of daytime alertness by as much as 32%. So, OK…we may not be prisoners of war, but as parents of children who are complex, we are certainly prisoners of circumstance. People say, “I don’t know how you do it.” We do it without thinking, as anyone would. We don’t calculate those lost hours of slumber, we instead worry about our children: administering medications, topping off feeding bags with formula, infusing IV fluids and nutrition, silencing alarms, and changing diapers. We cherish every second of sleep, REM or not. We’re grateful for any help, grateful for spouses who let us have, “Just five more minutes!” and grateful that we can do all we do for our children. But adding to our lack of quality sleep, we worry about the future. We worry about what would happen to our families if something were to happen to us, worrying ourselves deeper into a sleep deficit. Is there anything you can do when you’re stressed, sleep deprived, and feeling the effects? You can find helpful sleep tips all over the internet, but what happens when the problem runs much deeper than too much caffeine, eating in bed, or a spouse or pet taking up too much room? Is there hope, and help, out there for parents in need of catching up on sleep? Taking help when offered is the first step. Take a nap while a friend or relative sits with your child. As difficult as it may be, release the reigns to your partner and let him or her take a shift so that you can get at least a small amount of uninterrupted sleep. Look into nursing services, respite care, or personal care attendant (PCA) hours for your child. Start by looking at what your insurance plan covers in terms of home care services and branch out into community programs like palliative care, Easter Seals, and state and city government resources. The ARCH National Respite Network and Resource Center has a Respite Locator that allows caregivers to search by state, the age of the child, and the child’s condition. Finally, we all know that accepting help and actually taking that nap is easier said than done, due to many factors. But trying to focus on our own physical and emotional health is the best thing we can do for our children. They need us just as much as we need them. 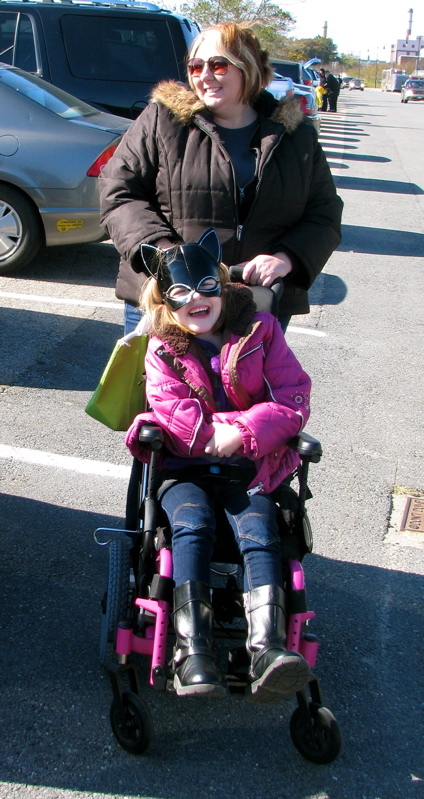 Lindsay Knops is the tired mom of Ava, 5, who has mitochondrial disease and the myriad health problems that accompany it, making sleep a precious commodity. She lives just outside Boston with Ava and her husband, Dave. Thankfully, the gods of sleep have smiled upon the Knops family and they all spend significantly more time sleeping than they previously did. Keep up with Ava via her CaringBridge site at www.caringbridge.org/visit/avaknops.